2 cups milk or any combination of milk, cream or half and half. You can also use skim milk. Whisk together the cocoa, sugar, salt, and about 1/2 cup milk in a small saucepan over medium-low heat until cocoa and sugar are dissolved. Stir in the vanilla, add mini marshmallows and serve. If you like it frothy, whip it in the blender. Enjoy a hot cup of cocoa at Halloween, Thanksgiving and Christmas during the colder weather months. 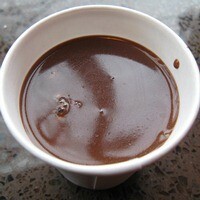 You can drink hot chocolate anytime with your favorite friend, parent or sibling. It is easy to make and delicious to drink!